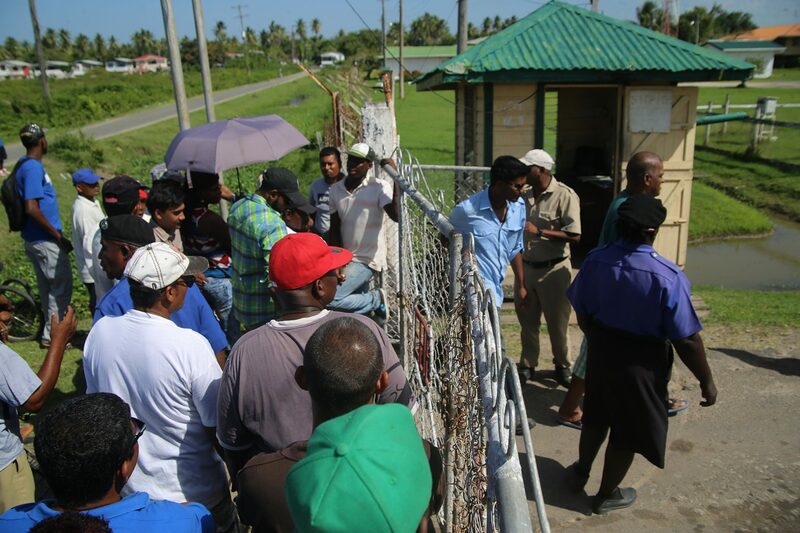 Some of the former workers gathered at the gate of the Enmore Estate as they waited to receive their severance payment yesterday afternoon. 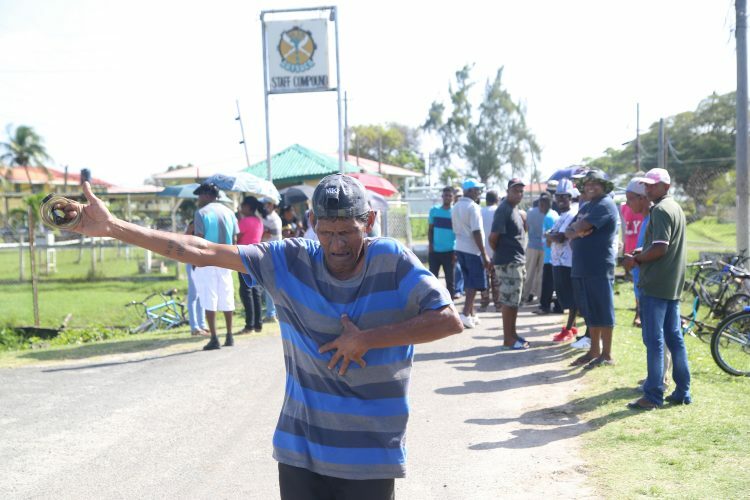 Hundreds of ex-sugar workers yesterday began receiving severance payments at the Enmore Estate but while many were happy to finally receive their “hard earned money,” some were still grappling with their anxieties from not having jobs. The former workers, armed with umbrellas and other makeshift forms of shelter from the sun, lined up in front of the gate of the estate yesterday afternoon and patiently waited to be called to the payment office to receive their payment. The distribution of cheques started at 2 pm and many of the former workers dubbed the process unorganised. “From what it looking like, is like they taking a whole 10 minutes just to give one person dey money. Watch how many of we out here. At least they coulda call we and tell we who to come but everybody show up and they got we waiting in lines. Obviously they not going to go all night and some of we got to go home,” one of the ex-workers said. 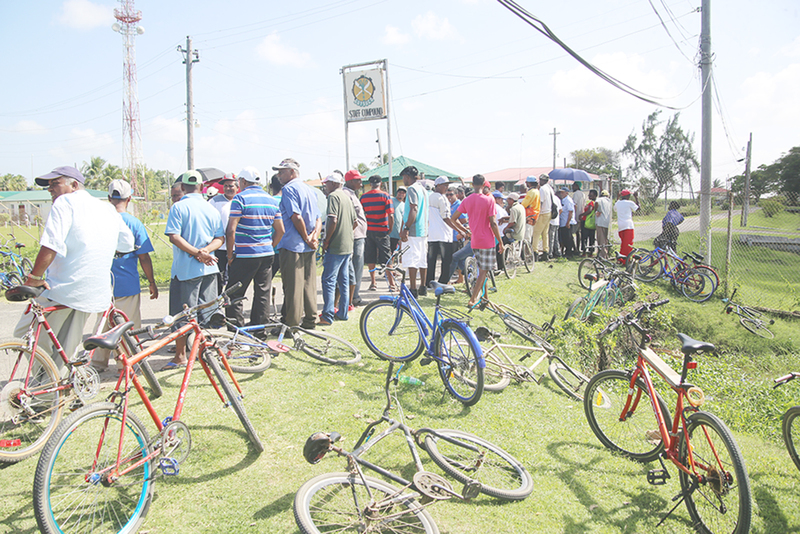 Ex-sugar workers lined up in front of the Enmore estate yesterday as they awaited their severance payments. A laid off worker dancing in front of the estate yesterday afternoon. 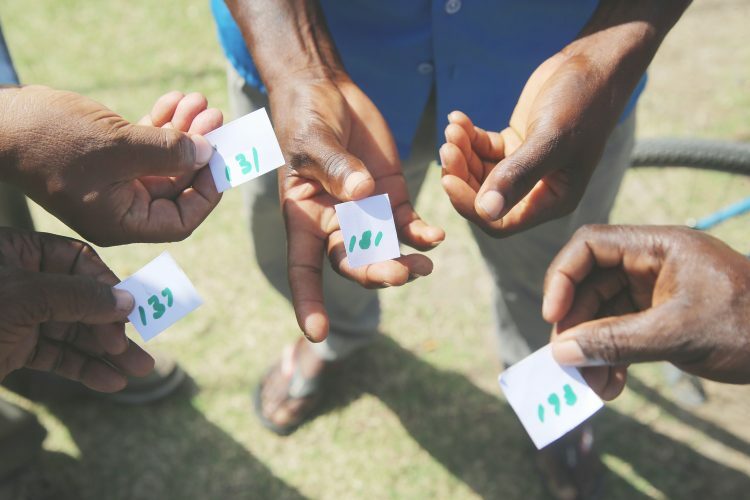 The numbers that the ex-sugar workers received as they awaited their turn to collect their severance payments. Just behind the line of ex-workers there was a sea of bicycles. A group of ex-workers huddled under a large tree to protect themselves from the sun, while others were scattered around the area. One man was so happy to receive his money that he started dancing and entertaining the crowd. Workers who had not seen their ex-colleagues since being laid off took the time to “catch up” and many were often lost in conversation about their lives away from the sugar industry, which one worker said was all he knew. Slowly, sometimes four at a time, the ex-workers were let in through the gates and they exited even slower. While some of them wore broad smiles on exiting, others wore blank expressions. “I just pleased with whatever I get. I work there for five years in the field workshop and I haven’t found a job yet. The money I get gon help me out for the time but what I gon do after? I don’t know but I just happy right now that I get the money,” Himchand Beharry told Stabroek News just before jumping onto his bicycle and racing home. Another worker, Kumran (only name given), who said he had given quarter of a century of his life to GuySuCo, echoed Beharry’s sentiments. Kumran said that he was happy to have finally receive the money that he worked hard for. “I get half. Them say that I entitled to a million and I get $500,000 but that is what them give me and I can’t do nothing ’bout that. Good thing is that I get a job around the place and I wukkin’ already but the money I gon use to do some fine things around the house. I living in Foulis and I got nuff work to do on me house,” he said. As more left the estate with either their full severance payment or half, the majority said that while they were happy to have finally received their money, they were still worried about finding jobs. “They [the government] shouldn’t act like they are doing the sugar workers a favour because at the end of the day they were wrong. They were wrong fuh holding back we pay a whole month after. That is unlawful and it’s against the law. So they shouldn’t use this and act like giving us this lil money finally is doing we a favour because you not even getting all. They can do us a favour and find jobs. People want jobs,” one of the ex-workers waiting on his payment said. “It’s something that every one of us could look at. If you invest in a business and are not making a profit, then it’s better if you leave the business. But the problem is them paying our severance. There is nothing we can do, we cannot force them but they also need to consider that we are all citizens of this country and everybody have their own family to look after and paying the severance in half is not right and I am not happy with that,” Surajuden said. Government has said that ex-workers who are entitled to severance pay of $500,000 and under are being paid in full while those who have amassed payment of over that amount will receive 50% this week and the other half before the end of the year. Almost two weeks ago, a supplementary budget of $1.93 billion was approved by the National Assembly to assist with the payment of severance, after Minister of State Joseph Harmon had indicated that only $500 million was allocated in the 2018 budget for the payment of severance to former workers.